When you have Mac Mail configured to automatically download new messages (it is the default setting, but you can change how often Apple Mail will automatically check for emails), it will give you both a visual and aural cue that new emails are ready to be read. The Mail icon in the dock will display the number of unread messages in overlay, and the new email sound will play (whether your speakers' volume is muted or not, you just won't hear it in that case). This tutorial will show you how to change the new email sound Mac Mail will play, how to turn off the new mail sound altogether, and how to disable other sounds in the program (these settings are separate from your Mac OS X "Sound Effects" options). When the options dialog opens, select the General tab, if needed. The third setting is a dropdown menu labeled "New mail sound" - by default, Apple Mail uses a sound file called "New Mail Sound", with which you'll be all to familiar since it is also used on your iPhone or your iPad. Click on the dropdown to see your options. 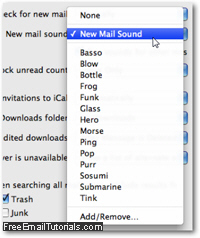 To disable the new email sound in Mac Mail altogether, simply select "None" at the top of the dropdown menu. In that case, your only feedback when new email messages arrive will be the white-on-red number on top of the Mail icon in the dock. If you can do without the charming Swoosh sounds of successfully sent messages in your email program, and other such audio feedback, simply uncheck the "Play sounds for other mail actions" checkbox right below the New mail sound menu.